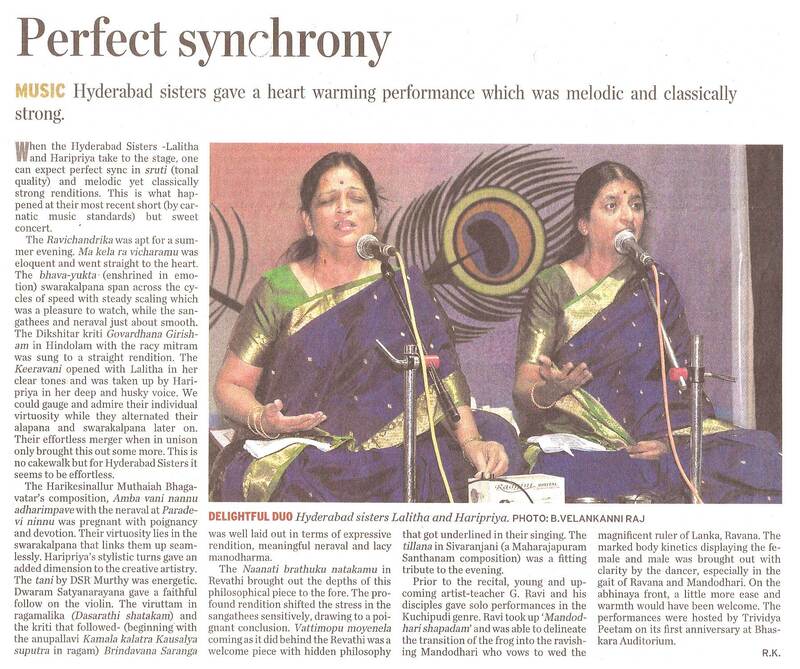 Among the duet singers in classical Carnatic music, Lalitha and Haripriya, popularly known as the Hyderabad Sisters, are considered to be the most outstanding, with a large following in all places where the rasikas have a taste for pure classical music. Lalitha and Haripriya are the disciples of Sangeetha Vidwaan Sri T.G. Padmanabhan, who belonged to the famous Alattur school of music, being the direct disciple of Sri Alattur Venkatesa Iyer. The Sisters hail from a highly cultured and accomplished family of Hyderabad. They are the daughters of Smt. Saroja and Sri B. Sivachandra. They were born on 06-10-1950 and 27-09-1952 respectively. Their mother Smt. Saroja, who was also a disciple of Sri T.G. Padmanabhan, was their first Guru. Having had a rigorous intensive and conventional training in the chaste classical style for several years under Sri T.G. Padmanabhan, they have developed an excellent Manodharma, which has been attracting knowledgeable connoisseurs of classical music. Attracted by their performance in their home state of Andhra Pradesh, invitations came in large numbers from all over the country. 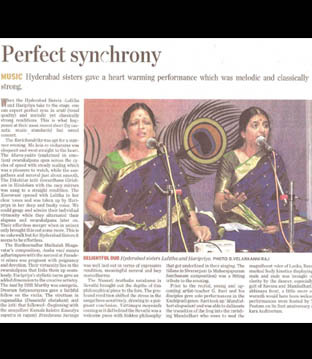 Gifted with appealing and melodious voices, the Hyderabad Sisters have been regaling large audiences in every sabha with extraordinary appeal and appreciation. Their first performance , during the auspicious Navaratri festival in 1960 at Shankar Matt, Hyderabad, was an astounding success and all the stalwarts who heard them then, predicted a very bright musical future for them. Winners of several awards during their school days, the Sisters went on to win the All India Radio competition in 1968 and 1969 respectively. First prize winners of All India Radio competitions (1968). 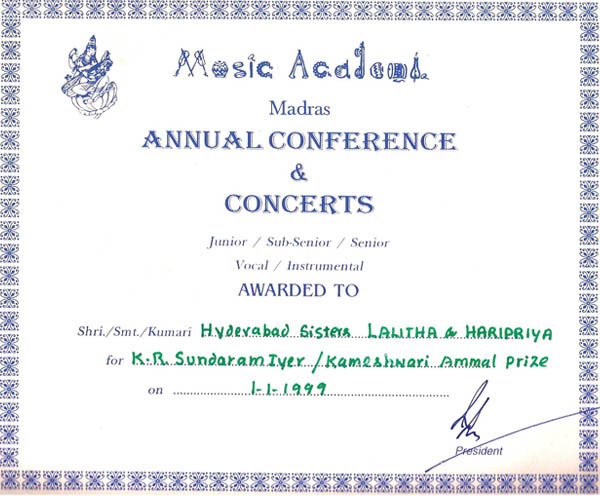 They are now TOP grade vocal artists of All India Radio. 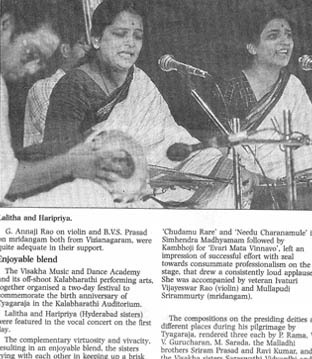 Their very first performance in Chennai in the Krishna Gana Sabha was a great hit and there was instantaneous popularity as large crowds began to gravitate to sabhas where there performances were slated. Since then, there has been no looking back and during the music seasons, they featured in atleast a dozen sabhas every year. Apart from giving concerts in all the sabhas of the country, the sisters have extensively toured the United States of America, Canada, Singapore, U.K. and Dubai. 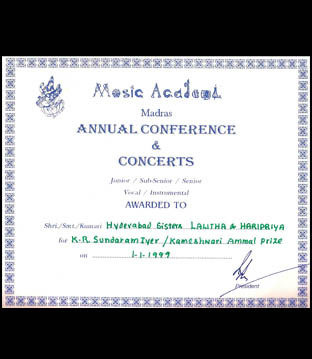 The sisters served as teaching faculty of Government music colleges in Hyderabad and Secunderabad respectively. They have trained several students who are already performing at national level in several centers and have also secured very good A.I.R. grading. 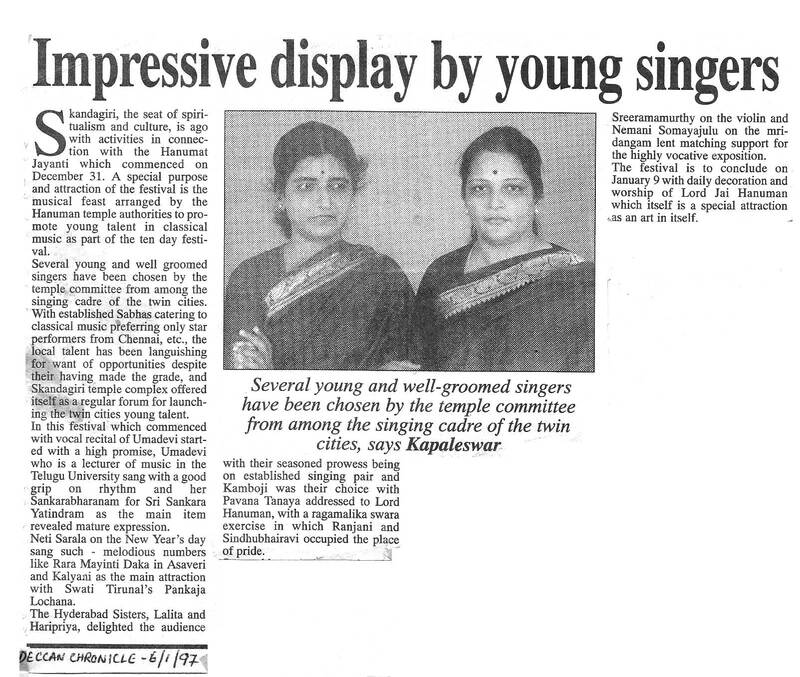 Flattering coverage of their performances began to be flashed in a number of leading newspapers. Music critics have often paid glowing tributes to the performances in varied styles. 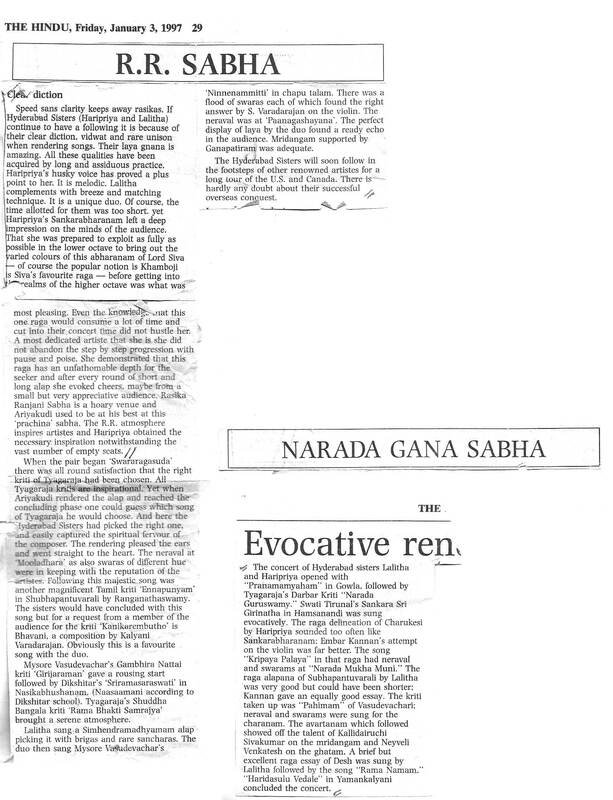 As an instance, the Newstimes of 04-02-1994, writing on their concert, commented inter alia as follows. “It was again a large gathering glued to their seats to the last minute on the second day of the Aradhana”. 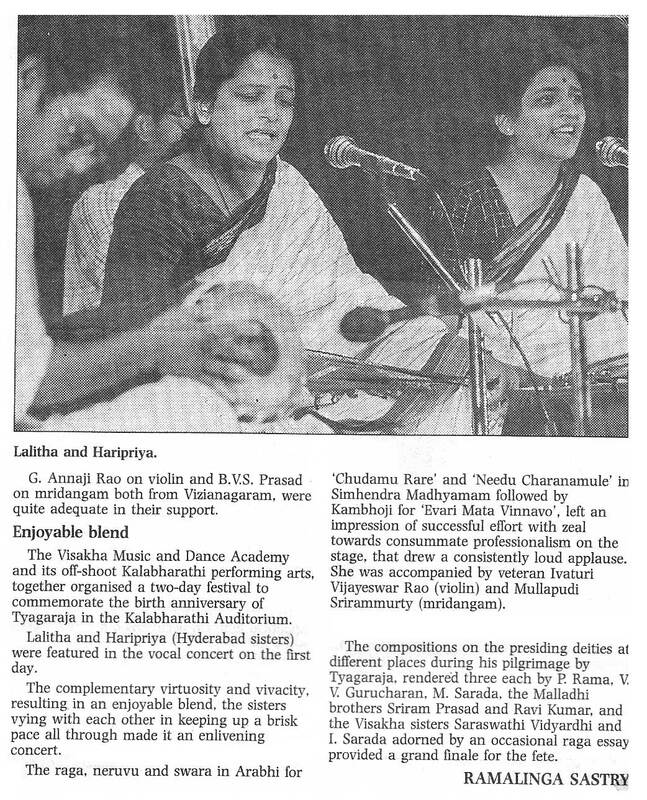 Writing under the caption “Hyderabad Sisters gripping concerts”, the Trinity observed inter alia, It(Haripriya's) was charming Charukesi all the way. Her sister earlier sang Hemavathi alapana. 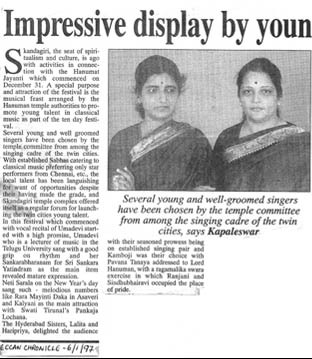 Hyderabad Sisters, whose popularity graph has shot up in recent years gave a memorable performance, and RRC referred to the popularity without much assistance from media or sponsorship. 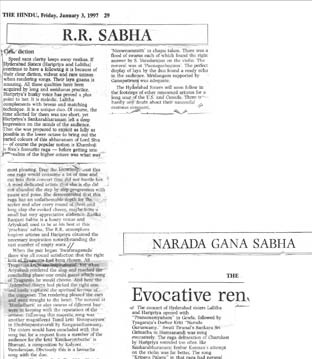 Writing about their concert under the aegis of Shanmukhananda Fine Arts and Sangeetha Sabha, Bombay, the Times of India, Bombay dated 23-09-1993 wrote as follows. The sisters have excellent rapport, each adroitly catching up and expanding the phrase of a raga or swara passage that the other vocalised, evolving into a harmonious whole. 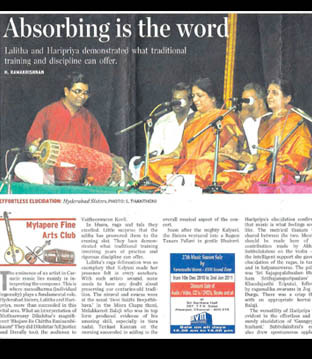 This was particularly evident in the Shankarabharanam composition of Dikshitar “Akshayalinga Vibho.” The raaga was explored in depth and very competently bringing out its majestic swaroop with all its shades and nuances. The Neraval and Kalpana swaras were just as imaginative and with the evocative rendering of the krithi; It was without doubt the piece de' resistance. The upswing in their popularity continues un-abated. Almost all the prestigious sabhas of the country have been giving them repeated engagements to perform in various gana sabhas at the respective places. Their style of singing has been unanimously acclaimed as one of the best that rasikas have ever heard. 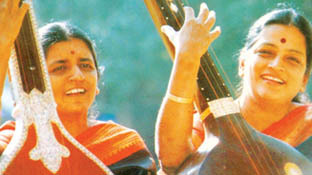 The sisters have specialized in singing raga alapana and neraval, the two most important aspects of Manodharma. 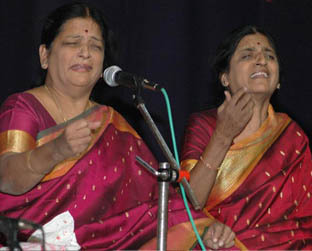 In every concert one raaga is taken up for delineation in the true jugalbandi style, where both the sisters alternatively sing phrases and weave a fine raaga. 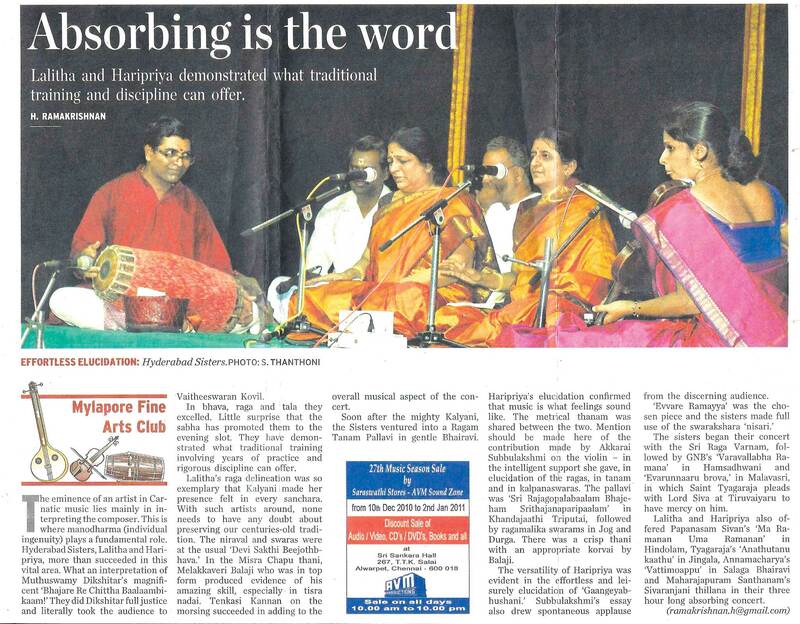 This style of singing is prevalent in the Hindustani music and has been adopted very efficiently by the Hyderabad Sisters in Carnatic music. 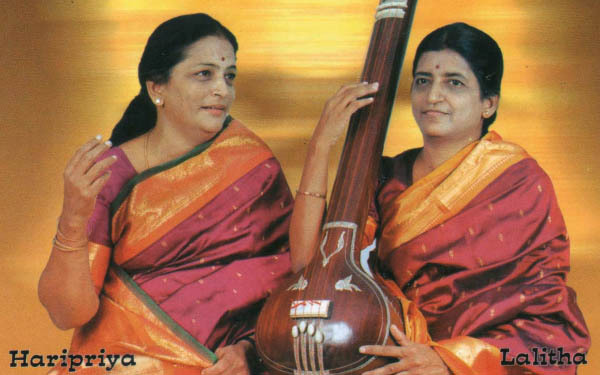 The sisters have sung several intricate pallavis like the Panchanada pallavis, Raagamalika pallavis, Naalkalai chauka pallavis which have won the acclaim of several great vidwaans. 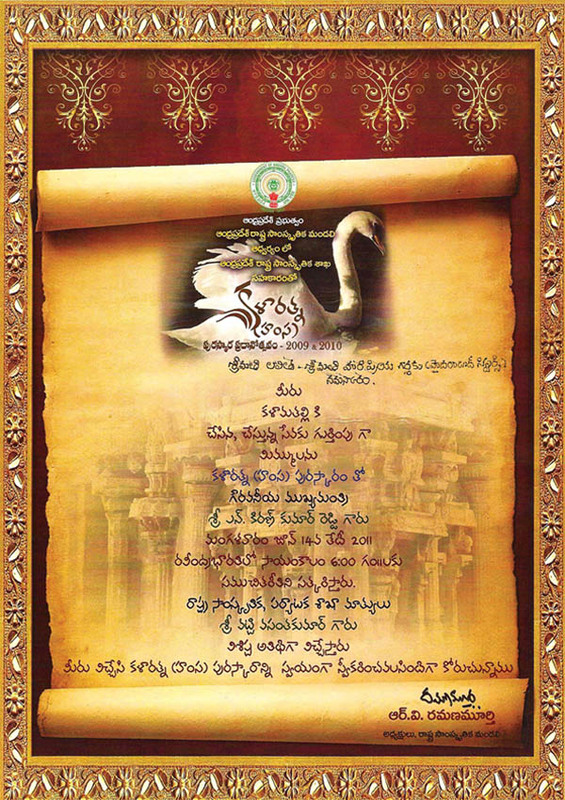 They have brought to light several rare compositions of lesser known and contemporary composers like Sri Ogiraala Veeraraghava Sarma, Sri Valajapeta Venkataramana Bhagavatar, Mysore Sadashiva Rao, Kalyani Varadarajan, Swarna Venkatesha Dikshitar and Madurai T.Srinivasan.They have sung some compositions in rare ragas for the archives of A.I.R. Vijayawada and compositions of Mysore Sadashiva Rao for the archives of A.I.R. Hyderabad. 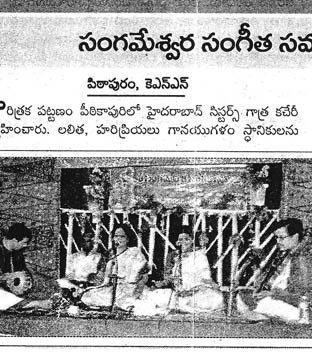 Their Bhakti Ranjani programs wherein they have sung keerthanas of Annamacharya- Narayana Theertha, Puttaparti Narayanacharyulu, Aripirala Vishwam, etc. are extremely popular. 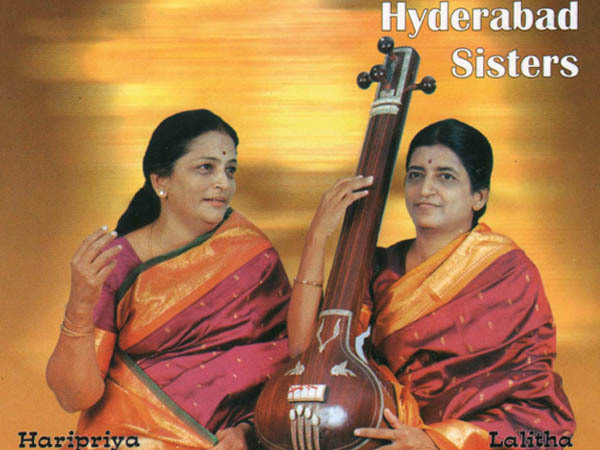 Hyderabad Sisters are one of the very few artists of Andhra Pradesh who are invited to give concerts on special occasions like Purandara Dasa Jayanthis, Annamacharya Jayanthis, Papanasam Sivan day, etc. 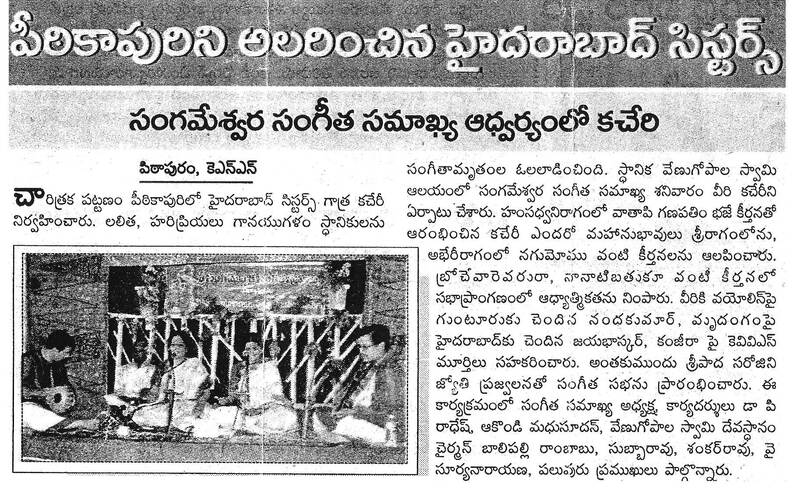 to sing exclusively the compositions of the vaggeyakaras in whose memories the function are conducted. The sisters have participated in several seminars and have conducted workshops on music on several occasions.